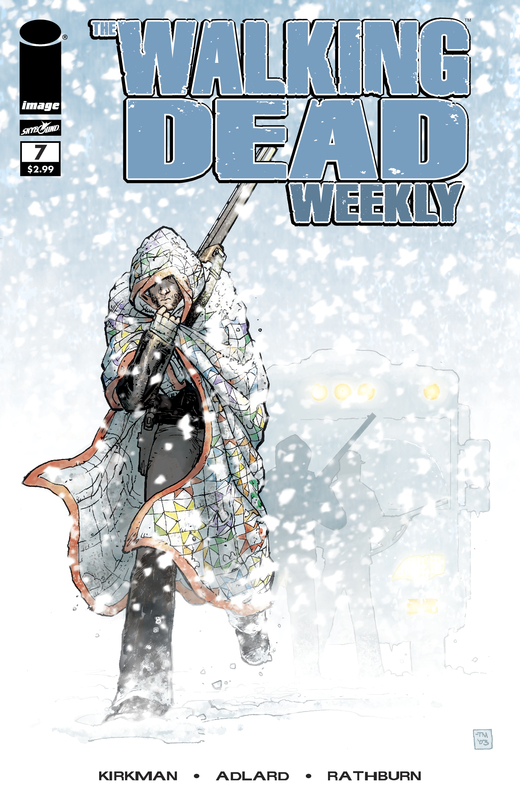 Now that season 4 of The Walking Dead TV show is over, it’s time to return to the comic book series. The group buries Shane, forms a plan for their near future, and meets a group of fellow survivors, one of whom is familiar to viewers of the TV series. With the death of Shane, Rick’s position as leader of the group is solidified. The group agrees that it’s time to get further away from Atlanta and Dale says that they all knew it before then but Shane had gotten them through a lot before Rick arrived. They respected Shane and he was adamant that the government was coming to fix everything. While on the road, the group meets up with Tyrese, his daughter, Julie, and Julie’s boyfriend Chris. Both groups are wary of each other and for good reason. Tyrese as a character seems similar to the TV version of him but in the TV series he doesn’t show up until later, is with a larger group, and has a sister instead of a daughter. I’ve been avoiding the third storyline from this issue because it was such a mess on the TV series and I was hoping that it was something that wouldn’t have transferred over from the comic. We get flashbacks to Lori and Shane before Rick had joined the group and find that they had slept together at least once. This is followed up with the cliffhanger revelation that Lori is pregnant. Dun dun dun! Ugh.